American Agri-Women hosts an annual Leadership Academy. The Leadership Academy is a free webinar series designed to supplement and sustain our live leadership development events for members and non-members. The series focuses on a variety of topics. If you would like to suggest a topic or become a Leadership Academy webinar presenter, please email aaw@americanagriwomen.org. A new interactive series of online sessions, called “Cultivating Resiliency for Women in Agriculture,” is now available to help women in agriculture cope with stress. The series of six 90-minute webinars is a joint project of American Agri-Women, District 11 Agri-Women, University of Minnesota Extension-Women in Ag Network and the Upper Midwest Agricultural Safety and Health Center (UMASH). Death by suicide is the 10th leading cause of death in the US. Living in rural areas and being in the agriculture business, brings increased risk factors. This webinar will help you identify the risk and protective factors farmers face related to suicide. It will give you tools and strategies to identify if someone you know is at risk, help you to ask difficult questions and ways to access resources to get additional support. The topic for discussion will last approximately 40- 45 minutes and then an interactive Q & A period will utilize the remaining time. All sessions in the series will be recorded and made available after the session for those who could not make the live session or for those who would like to listen again. Shauna Reitmeier, MSW, has over 20 years of experience in the behavioral healthcare and cognitive disabilities fields. She currently serves as the Chief Executive Officer of the Northwestern Mental Health Center, which serves a comprehensive array of behavioral healthcare services to adults, children and families across six (6) rural and frontier counties of Northwest Minnesota. Her background of growing up on her family’s two-generation farm, working the fields during harvest and experiencing the stressors and joys the agriculture way of life brings has brought awareness and insight to her work within the communities she serves. “Our goal is to help women in agriculture focus on what they can control in these challenging times and connect them to resources and information to help them endure stress,” says Jeanette Lombardo, AAW president. The “Cultivating Resiliency” project, which is funded by a UMASH grant, also includes a survey to help gather data to develop future programming. Here’s the link to take the survey: z.umn.edu/cultivatingsurvey. Shauna Reitmeier and Brenda Mack, both of whom have agricultural backgrounds, will lead the webinars. Shauna Reitmeier has a master’s degree in social work and over 20 years of experience in the behavioral healthcare and cognitive disabilities fields. She is CEO of the Northwestern Mental Health Center, which serves adults, children and families in Northwest Minnesota. Brenda Mack is a behavioral health and human services consultant, trainer and presenter and an assistant professor in the Social Work Department at Bemidji State University (BSU). Mack is a licensed independent clinical social worker through the Minnesota Board of Social Work. January 25 – You Can’t Pour from an Empty Cup — How do you fill it up to support yourself and others? In this session, Shauna Reitmeier will share how stress, when not addressed, can deplete farming and ranching women’s energy and their ability to effectively keep up with their responsibilities. Participants will learn ways to manage stress and come up with ways to prioritize to keep energy high and meet many demands. Be prepared to ask questions or make comments and the presenter will respond. In this session, Shauna Reitmeier will share the importance of relationships in farming and ranching lives. Ways to initiate, maintain or improve communication with spouses, family members, neighbors and community members will be discussed. Be prepared to ask questions or make comments and the presenter will respond. In this session, Brenda Mack will focus on increasing joy and happiness in your farm life. Self-compassion, random acts of kindness and expressing gratitude are practical ideas that will be further explored to bolster positive feelings. Be prepared to ask questions or make comments and the presenter will respond. In this session, Brenda Mack will provide a brief overview of how stress affects our health and well-being. Exploring self-care practices as an option to deal with worrying and stress will occur. Participants will learn about a practical tool to build and implement an individualized stress-reduction plan. The importance of connecting with others as part of self-care will also be addressed. Be prepared to ask questions or make comments and the presenter will respond. In this session, Shauna and Brenda will define and discuss farming and ranching stress that may be affecting women in agriculture. The presenters will address possible outcomes of excessive worrying and hopelessness. Dealing with stress in healthy and healing ways will be highlighted. Be prepared to ask questions or make comments and the presenters will respond. In this session, we will discuss how good farm recordkeeping can save you both time and money. We will discuss strategies to keep up to date with records, identify ways to record transactions in a detailed manner—including how to separate family living and farm expenses, overview electronic recordkeeping systems, and talk about how benchmarking can enable more deep understanding of your farm’s financial position. Understanding your farm’s financials is more than balancing a checkbook. We will discuss managing capital and credit for your farm business to succeed and grow. We will also explore your credit options with bank loans, government loans, and alternative financing. Example tools and templates will be provided. Presenter: Amanda Durow is a Senior Credit Officer with CoBank, the largest Farm Credit Bank. She focuses on dairy, livestock, agribusiness, and grain/farm supply companies. She holds a bachelor’s degree in Animal Science and master’s in business administration from the University of Minnesota. Amanda also is a fifth generation crop and dairy farmer with her husband and his family in Minnesota. You’ve launched your business on social media. Now what? Learn methods to keep your audience engaged and gain new followers in the pursuit of brand awareness and sales. Presenter: Caitlin Keck is the Marketing & Communications Director at Environmental Tillage Systems (ETS) in Faribault, MN. The company manufactures and sells SoilWarrior strip-tillage equipment primarily in the United States and Canada. Caitlin has a B.S. in Agricultural Education from the University of Minnesota – Twin Cities and an MS-MBA in Food and Agribusiness Management from Purdue University. She grew up on a dairy farm, and her husband works for his family’s corn, soybean and hog farm. In her free time, Caitlin enjoys baking and gardening. She sells produce directly to customers and a local grocery store. The first session in our Essentials of Farm and Ranch Business Management Skills – Series 2 – Business planning is an essential skill to help organize thoughts, make plans for the future, consider and test alternatives before investing money, and other resources in your business. A written plan is key tool in getting a loan approval and other funds to start or grow your business. We will dive deeper into the plan including mission, vision, goal setting and SWOT analysis. We will also review both simple and more complex plans. Additional “work” sessions will be offered via Go To Meeting for participants who would like to have more in-depth coverage of business plan topics. Presenter: Doris Mold has coached hundreds of people in developing their own business plans in the past 19 years. She teaches Farm and Agri-Business Management at the University of Minnesota; farms with her husband and daughter; is President of Sunrise Agricultural Associates, an ag consulting business. She is also the current Past-President of American Agri-Women. Doris has a Master’s of Science degree in Agricultural and Applied Economics; and holds a B.S. in Agricultural and Applied Economics; Agricultural Education and Animal Science, all from the University of Minnesota. Let’s face it, work-life balance is a myth. It is a continual juggling act of priorities and timelines. The key is how to engage fully in the moment to produce your desired results. Tune in and double down during this webinar. Presenter: Heather Hampton+Knodle, AAW First VP. Get the latest on key policy issues that AAW will be taking to “The Hill” in Washington, D.C. at AAW’s Annual Fly-In June 4-7. The second half of the webinar will focus on logistics and planning for Fly-In. A joint project of American Agri-Women and the Farmer Veteran Coalition through a USDA Beginning Farmer and Rancher Development Program Standard Grant Program Project. 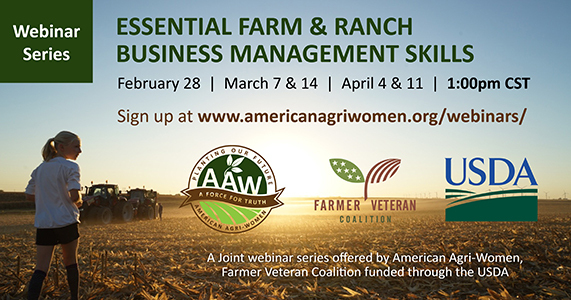 Anyone may join us for this webinar series, but we are encouraging veterans and in particular we are trying to empower women veterans in their quest to be farmers and ranchers. In this introductory series participants will develop their knowledge and skills in some essential areas of farm and ranch business management.Webinars will be offered on Tuesdays, at 11 a.m. Pacific time (12 noon Mountain time; 1 p.m. Central time and 2 p.m. Eastern time). Each webinar is scheduled to be one hour in length including question and answer time. Sessions will be recorded and available on this page following the webinar. Understanding your farm’s financials is critical for farm success. We will explore records that are needed for your business to succeed and grow, including income statement, cash flow, balance sheets, and budget projections. We will discuss what a lender may require for your application and how to ask for financing. Example tools and templates will be provided. Build your business on a firm foundation with this webinar that will decode some jargon and walk through the essentials for a start-up. Your audience is key to a successful business. You will learn how to create engaging content as well as best practices to reach your target audience. Business planning is an essential skill to help organize thoughts, make plans for the future, consider and test alternatives before investing money, and other resources in your business. A written plan is key tool in getting a loan approval and other funds to start or grow your business. We will cover the key sections of the business plan including but not limited to: goal setting, operations, marketing, risk management, personnel and financial. We will get you started on the right path using the AgPlan business plan template. Additional “work” sessions will be offered to participants on to help participants work through their plans. In this session, you will learn about the basics of farm recordkeeping. Proper farm recordkeeping can save you both time and money. We will learn why it is important to keep records, discuss how to classify assets and liabilities, identify ways to record transactions, briefly overview the four primary financial statements, and talk about electronic recordkeeping systems. Session III: How to Hire a Rock Star (and keep the drama queens out)! Description: In the final session of our three part HR series, participants will examine a successful hiring process that can be adopted for operations of any size and understand how to implement proven practices that will help them become the envy of their neighborhood. Description: In part two of a three part HR series, participants will dig deeper into organizational strategy and health and recognize how they impact employee engagement and retention. We will explore the process used to achieve clarity in business and the consequences of not having a cohesive leadership team. You will understand how these building blocks can impact the kinds and types of employees who work for you. Description: In this first session of a three part HR series, participants will become familiar with the many different components that comprise an effective on-farm Human Resource program – from recruiting to disciplining – and the importance of everything in between. Upon completion of this session, participants will recognize their on farm HR deficiencies and identify ways to overcome them. In a digital age, AAW is moving towards implementing leading technologies to help us communicate with our members, affiliates and the world about our mission. We want to take the time to make you aware of the new technologies and how you can use them in your affiliate chapters and other organizations you may be involved with. We will talk about how to utilize Excel, JotForm, Square, FreeConferenceCall.Com and Google to help your affiliate establish membership databases and email lists, online dues payments, online event registrations. We will also discuss how to create an agenda, gain feedback on the agenda, and then collecting feedback after the meeting or event. We will also talk about how to ensure your affiliate “brand” so your communications look professional. Come with questions! Consultants from Ag Transition Partners describe how they conduct the on farm family coaching piece and bring geographically dispersed families and successors together to discuss and overcome the interpersonal barriers to successful planning. They help you define how the family unit will work together in an empowered manner. Members of Ag Transition Partners, a multi-state collaboration of educators and agribusiness consultants, describe the multi-layered approach they use to help families prepare for farm transition planning. Their approach was piloted in a USDA Risk Management grant anchored by a family team building process and sustained with individualized coaching. This approach helps farm families ensure the legacy of their operations. Host: Juanita Reed Boniface, owner, JRB and Associates and Boeckenhauer Cattle. Juanita has logged thousands of hours as an educator and has an impressive tool box to share. In this team building webinar she will lead us through understanding and identification of basic principles of teamwork, and the characteristics of the “ideal” team. Seventeen years of Women’s Agricultural Leadership – conference, mentoring and networking programs and still growing! Find out about the genesis of this successful program and how it has expanded opportunities for women in Minnesota and beyond. The atmosphere at the conference is absolutely electric. Find out why, along with lessons that have been learned along the way. Host: Dr. Donita Whitney-Bammerlin, academic program coordinator, Edgerly Outstanding Instructor Fellowship, Department of Management, Kansas State University. Conflict is an inevitable part of life. Take part in this webinar to learn about effective conflict management strategies.